SEOGWIPO, Jeju Island -- Sitting on the rocky southern coastlines of Jeju Island, the city of Seogwipo is known for its beaches, forests, waterfalls, parks and other cultural experiences one may stumble across on Korea’s volcanic island. It is also where winter is warmest and spring comes first. Jeju Island’s unique climate and culture derives from its distance from the mainland. Much like Hawaii, its indigenous culture grew independent from the dynasties on the Korean Peninsula, existing as the kingdom of Tamna before being annexed by the Joseon Dynasty in the 15th century. Traces of such history remains in its unique dialect, which is significantly different from any other in the country. For this -- plus several jaw-dropping natural wonders and the UNESCO-designated heritage sites -- the island has earned a reputation as a major travel spot for Koreans and foreign visitors alike. Those visiting the Seogwipo area this weekend can still catch the annual Jeju Hueree Apricot Flower Festival, which continues until Sunday. The festival held throughout Hueree Natural Park features various programs, including horse riding, traditional games, photo festivals and shows featuring indigenous animals like the Jeju black pig and, of course, an abundance of beautiful apricot flowers. Couples and families alike can be seen enjoying the scenery and taking photos at various zones set up inside the park. After that festival, a hydrangea festival is held from April to July, a muhly grass festival in September and October and camellia festival from November to January. Admission fees are 13,000 won for adults, 11,000 won for teenagers and 10,000 won for children. Seogwipo is famous for its camellia flowers that creep out from beneath the stone walls seen commonly in traditional Jeju-style homes. Sangye-dong and Wemi-ri in Namwon-eup are among well-known destinations to enjoy flowers in the southern region. 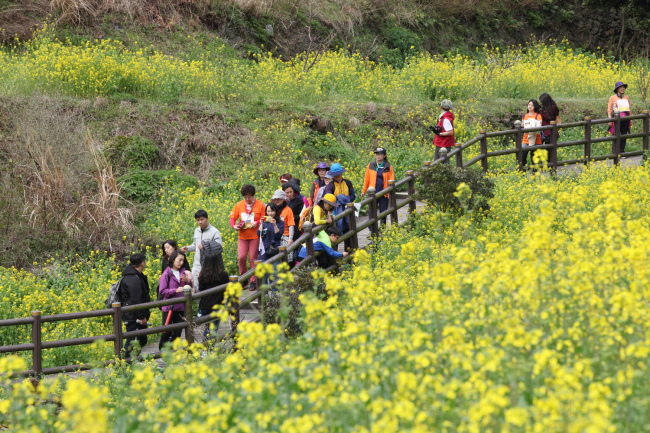 Seogwipo is also famous for its annual Yuchae (Canola) Flower International Walking Festival, which will be held March 23-24 across the seaside city. Each year, thousands of participants take part in the two-day festival, which kicks off and finishes at Jeju World Cup Stadium. The beautiful arena that was the site of South Korea’s glory at the 2002 FIFA World Cup is where walkers will kick off their 5-, 10- or 20-kilometer course. It costs 10,000 won to formally participate, but the course itself is public and open to anyone. The homepage for the festival -- cafe.daum.net/seogwipo-walking -- offers information about the event, but only in Korean. 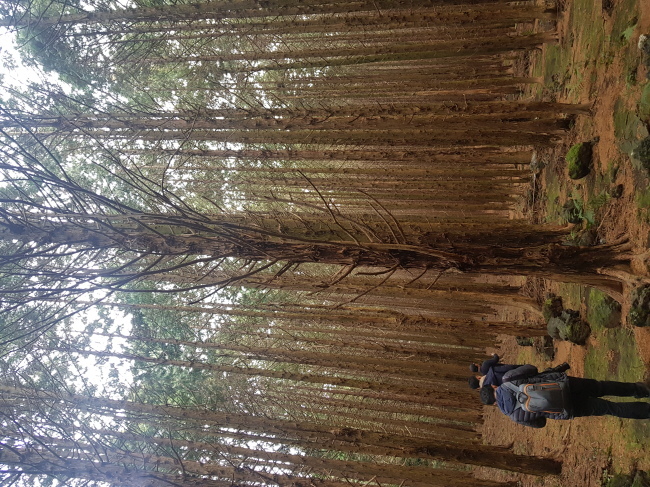 The seven-section Jeju Olle Trail, which makes up much of the courses in the festival, is a great place to start for anyone looking to take a stroll on the island. The homepage for the trail (https://www.jejuolle.org/main.do?lang=en) offers information on the routes in Korean, English, Chinese or Japanese. Blossoming flowers festivals are nice, but one looking to get an up-close look into Seogwipo’s famous natural environment should take a gander at Hannam-ri 1622. This is where “Muhchaewatsoopgil” (soopgil means “forest trail”) is located. The trail is littered with common camellia trees, Japanese cypresses, Japanese sugi pines and other trees found commonly on the island. Canola flowers scattered across the fields provide quite a spectacle in the spring, then are replaced by sunflowers in the summer and buckwheat flowers in the fall. Some of the evergreen species of castanopsis sieboldii trees take on a peculiar form in the forest, as the rocks sitting on them force them to spread out instead of up. This gives the trail its unique look. Along the trails are traces of the stone wall built during ancient times to mark borders between regions. This particular wall had extended for dozens of kilometers, all the way to Gasi-ri, but only parts of it remain now. Next to where the walls are located is a forest of giant Japanese cypress trees that block out the sun completely. Deeper in the forest is a river beside the “Sunnyuhbawi” -- rocks that the “sun-nyuh” (angelic figures) sat on. The gigantic volcanic rocks nearly resembling dinosaur fossils can be seen in the river. It takes two to four hours for the full trail, depending on which course you decide to take. A guide is available by prebooking from 9 a.m., but only in Korean. For booking, call (064) 805-3113. 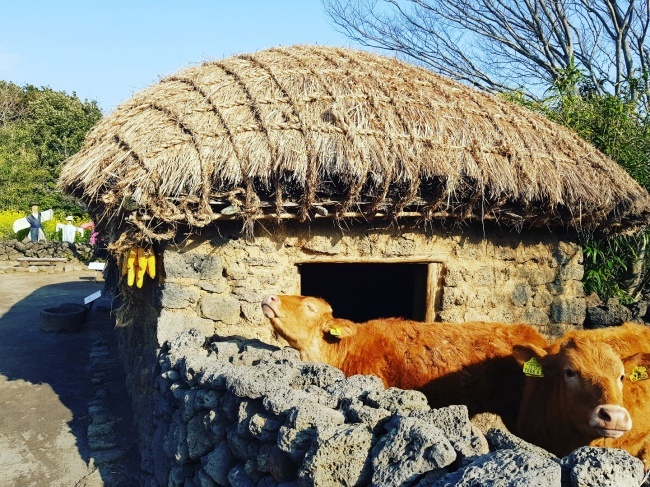 Near the southeastern cost of the island in Pyoseon-myeon is Jeju Folk Village, another popular attraction of Seogwipo. Based on consultation from historical experts, the 100 houses in the outdoor museum re-create a rural village of Jeju Island from the 19th century. Various workshops are located inside the village, from woodcrafts, pyrography and leather brushes to pottery, offering authentic products and hands-on programs. For more information in Korean, English, Chinese or Japanese, visit https://jejufolk.com. Seopjikoji beach, which literally means “narrow lands” in the Jeju dialect, is famous for scenery and infamous for strong winds. 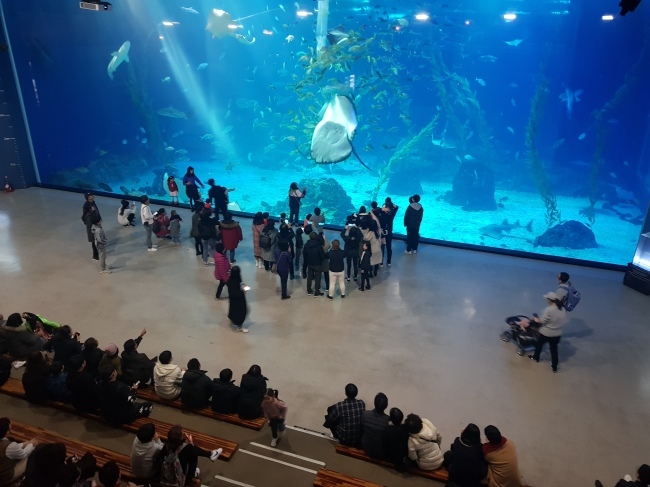 This is also where you can visit Hanwha Aqua Planet Jeju (www.aquaplanet.co.kr), the largest aquarium facility in East Asia, with around 450 species of marine life. Numerous lodging spots are also available around Seogwipo, including Daemyung Shineville Resort that opened last April. What stands out is the garden decorated with subtropical plant life and its view of two of Jeju Island’s most recognizable landmarks: Hallasan and Seongsan Ilchulbong Peak, which is registered on the list of UNESCO World Heritage.